122 L'ISLE, G. de. Les Isles Britanniques ou sont le R.me d'Angleterre.. d'Ecosse.. d'Irlande. ( Paris, 1702) Limites en col. ancien. Infimes rousseurs. - Slightly age-toned. 470 x 610 mm. State 4, with the address : "Ch�z l'Auteur sur le Quai de l'Horloge a L'aigle d'or." An accurate map for the time based on the foremost acknowledged authorities for each part : Speed for England and Wales, Pont for Scotland, and Petty for Ireland. Beautifully engraved, decorative map of the British Isles. Detailed to show towns, roads, rivers, lakes, counties, etc. Embellished with a decorative distance scale and a title cartouche. The latter depicts fantastic sea creatures, surmounted by Poseidon. - Shirley, British Isles, Delisle 4. 123 TARDIEU / LATTRE / VAUGONDY. Lot de 6 cartes. Ecosse (3), Angleterre (2) et Irlande (2). ( Paris, ca. 1780) Limites en col. ancien. Infimes rousseurs. 300 x 220 mm. 124 L'ISLE, G. de. / BUACHE, P./ DEZAUCHE, J.A. Les Isles Britanniques ou sont le R.me d'Angleterre.. d'Ecosse.. d'Irlande. ( Paris, 1800) Limites en col. ancien. Belle impression sur papier fort. 472 x 613 mm. � Maintenant chez Dezauche, Revu et Corrig� en 1800. 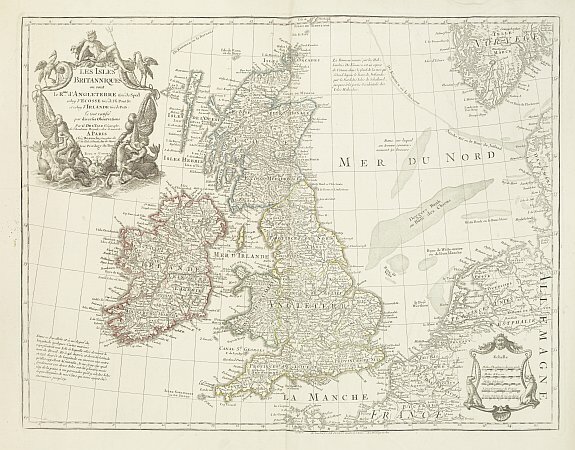 - An accurate map for the time based on the foremost acknowledged authorities for each part : Speed for England and Wales, Pont for Scotland, and Petty for Ireland. Beautifully engraved, decorative map of the British Isles. Detailed to show towns, roads, rivers, lakes, counties, etc. Embellished with a decorative distance scale and a title cartouche. The latter depicts fantastic sea creatures, surmounted by Poseidon. 125 CORONELLI, P./ NOLIN, J.-B. Le Royaume d'Irlande. ( Paris, 1690) Limites en col. ancien. Trou � droite dans la mer (2 cm), marges fragilis�es, traces de pliures, p�les mouillures. - Some water staining, margins frayed, tear in the sea (2 cm) on right hand side. 596 x 463 mm. 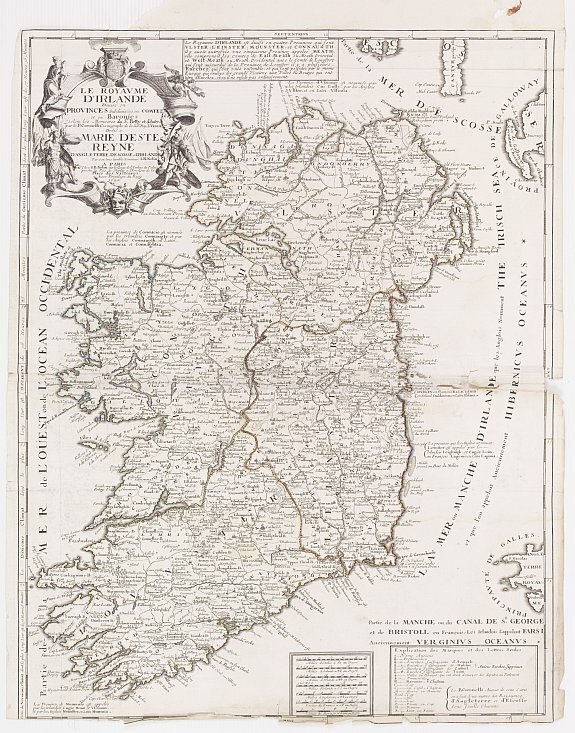 � Uncommon map of Ireland. A visually stunning map with a large title cartouche. Produced by the Venetian cosmographer Vincenzo Coronelli when he was working in Paris in the 1680's. Tillemon, who corrected and amended the map was, Coronelli's collaborator in Paris and J.B.Nolin was their publisher. Nolin must have published this map separately on several occasions as it is not regularly found in atlas form. 126 CORONELLI, P./ NOLIN, J.-B. Le Royaume d'Escosse. ( Paris, 1708) Limites en col. ancien. Papier uniform�ment jauni, fente en bas du pli central sur 4 cm. 2 cartes jointes : Vaugondy, Le Royaume d'Ecosse ; Philippe, l'Ecosse. (Bon �tat).- Paper browned, split in lower part center fold (4 cm into engraved area). 462 x 605 mm. 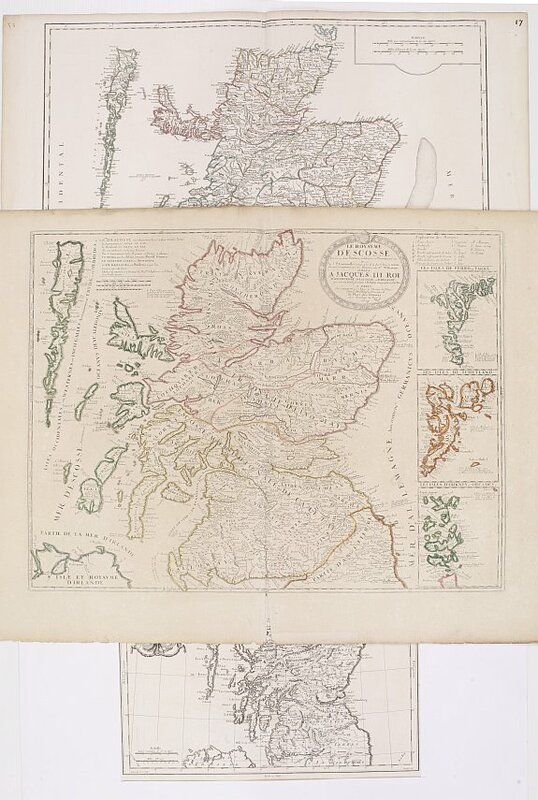 � Uncommon map of Scotland. This map was produced by the Venetian cosmographer Vincenzo Coronelli when he was working in Paris in the 1680's. Tillemon, who corrected and amended the map was, Coronelli's collaborator in Paris and J.B.Nolin was their publisher. 127 ROBERT DE VAUGONDY, G. / DIVERS. Ecosse. (5 cartes). ( Paris, 1751-1813) Limites en col. ancien. Quelques rousseurs. 485 x 570 mm. Lot de 5 cartes d'Ecosse dont 1 par Vaugondy et 4 autres de format in-4.